For today’s work I added more orange to the tendrils at the top, as well as starting on the green. 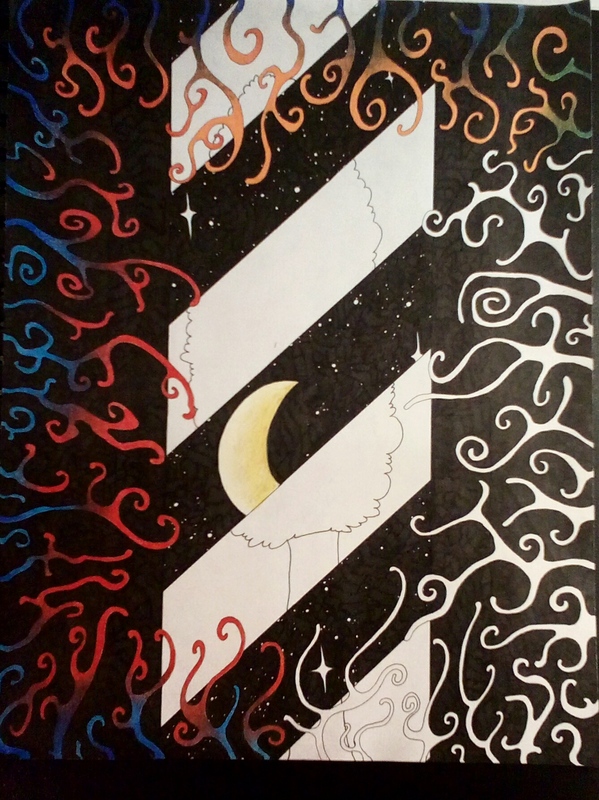 Then I finished all the diagonal space/night sections, which includes the coloring of the moon near the center. I still want to add a few colored stars as I find, in space/night photos, you usually notice a couple colored stars/lights in the sky. So, all I have left to do is finish the rest of the tendrils, which should take a couple more days. And then get started on the other scene in the middle. It will end up being more than just the tree. I plan on having some blue sky, clouds, perhaps some sunlight coming from the top right. Hopefully it all meshes well enough. I’m a little worried that it won’t, and I can’t exactly put my finger on why. I just hope the tree scene doesn’t look too… cartoony. Other than that, I really don’t have much else to talk about today. My hockey team is losing (big time. Like… record breaking big time) and today was kind of a boring day. Nothing really going on that’s standing out to me as important enough to talk about. It’s Friday though! I hope everyone is having a fantastic day.